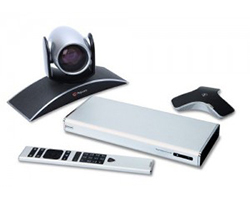 Polycom Group 500 720p with an EagleEye III camera is designed for use in conference rooms and delivers high performance and a simple user interface to experience an impressive collaboration session. IT administration will appreciate the compact design, broad interoperability and an exceptionally low total cost of ownership. The Group 500 is also easy to install, due to single-cable connections and a smaller design that can be deployed in more areas. The Group 500 is standards-based, and allows for connection to the other standards-based video solutions, regardless of brand. Native interoperability with commonly used UC business platforms allow users to integrate the Group 500 into their communications process. RealPresence Group 500 features Telepresence Interoeprability Protocol support to allow for a direct connection to Cisco system that is not standards-based.